What I do know seems scanty, and most of it is family lore, with little documentation as of yet. So although I may say something "was" something on this page, I have not always proved each of those statements to my own satisfaction. A woman who came to be named Ingebor Sofia Hansen immigrated from Norway to Chicago in around 1880. Norwegians, before 1920 or so, didn't have surnames in the modern sense, but only patronymics. So a man named Hans, whose father was named Ole, would be called Hans Olson, and a woman would also use a patronymic based on her father's name, whether she was married or not. Ingebor was born December 15, 1841 in Kristiansund, Norway. Kristiansund is in the north. There is another city named Kristiansand in the south, and I can't be sure that she wasn't from there. Her maiden surname may have been Skarpness. Her father's name was Ole Olson (so she might have been called Ingebor Olsdotter), and her mother's name was Elisabeth. She married a man named Hans Johnson in Norway and they had four children, Elizabeth, Hanna, Christine and John. The story is that her husband died in Norway. Her parents-in-law wanted her to live on with them and to serve their needs in an unpaid capacity, as was traditional in that country, but she, and her children, came to the United States instead. I don't know any birth or death dates for any of her children, except for Hanna, who was born June 14, 1868 in Norway and who died May 11, 1925 in Chicago. Ingebor may have been living on Hubbard St. in Chicago at the time of the 1880 census. In 1883 she was living on Desplaines St. between Hubbard and Indiana. In 1885 and 1886 she was living at 805 Seymour St. (now Campbell Avenue, between North and LeMoyne). On April 29, 1885 her daughter Elizabeth had a son, my grandfather Harry Hanson. I don't know who his father was, and I don't know what happened to Elizabeth afterwards, although my father said she died within two years of his father's birth. Odd Lovell in his A Century of Urban Life, a book all about Norwegian immigrants in Chicago, says that the majority of Norwegian women in Chicago worked in domestic service, so one could speculate, based on this information, about how Elizabeth came to have a child. Ingebor raised Harry. Hanna Hanson married Fred T. Larson, the artist, on March 24, 1894. They had two children, Martha (born in 1896), and Florence (born in 1899). By 1900 Ingebor and Harry were living with Fred and Hanna's family at 466 Potomac, between Washtenaw and California. In 1910 Ingebor was still living with Fred and Hanna, who were by then at 2935 N. Whipple St. Harry had married Antoinette Seghers in 1910, and they had their three children over the next decade. 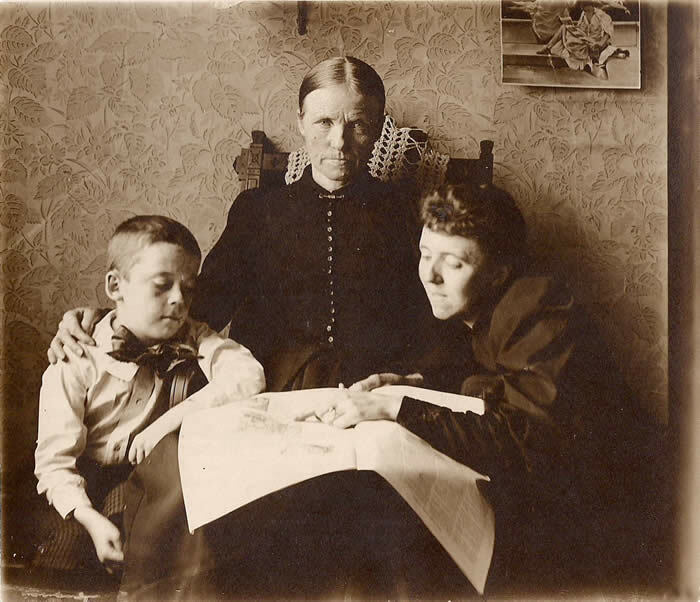 Ingebor was still living with Fred and Hanna when she died on January 1, 1918. Harry Hanson, Ingebor Hansen, Hanna Hanson Larson. Harry may be about 10 in this photo, which means it must have been taken in the mid 1890s.